Ventricular dilation in case of aqueductal stenosis cannot be considered simply the direct effect of accumulation of fluid upstream of the obstruction, but is a more complicated phenomenon. Greitz (41) suggested two different mechanisms, thereby differentiating an acute phase from a chronic phase. CSF blocked from reaching absorption site: In cases of acute intraventricular block, the CSF can’t reach its main absorption site. The ventricles increase in volume and this further impairs resorption by the periventricular capillaries. Ventricular dilation causes venous congestion: The ventricular dilation pushes the brain toward the skull and compresses the cortical veins, leading to venous congestion with increased blood volume and further increased ICP. Rise in ICP counteracts further ventricular dilation: The venous congestion and the brain swelling counteract the ventricular dilation, which otherwise would be fatal. Acute equilibrium reached with elevated ICP: At some stage a new equilibrium is reached at a higher pressure. The arteriolar and capillary regulation of fluid absorption in the periventricular brain capillaries finally balances the production of CSF inside the isolated ventricles. Over time ICP normalizes: The CSF pressure decreases, and a new equilibrium is reached at near normal pressure in the chronic phase of obstructive hydrocephalus (95). Brain loses its capacitance vessels: The capacitance vessels become compressed by the enlarging ventricles. This results in the loss of expansion of arterial vessels during systole with resulting decreased intracranial compliance (loss of arterial windkessel mechanism) and increased capillary expansion, increased CSF pulsations, and hyperdynamic CSF flow in the blocked ventricles (41). Further enlargement of the ventricles: The increased pulse pressure increases the transmantle pulsatile stress, which continues to dilate the ventricles even if the mean CSF pressure is normal (95). Focal weak points define pattern enlargement: The suprapineal, lamina terminalis, and infundibular recesses are the weakest parts of the third ventricle. Their walls are not covered by neural or vascular structures, as opposed to the lateral and inferior third ventricular walls, which are bordered by the two thalami laterally and midbrain inferiorly. Downward bulge of floor into interpeduncular cistern: Frequently, the floor of the third ventricle bulges downward into the interpeduncular cistern in cases of aqueductal stenosis (red arrow in image below). 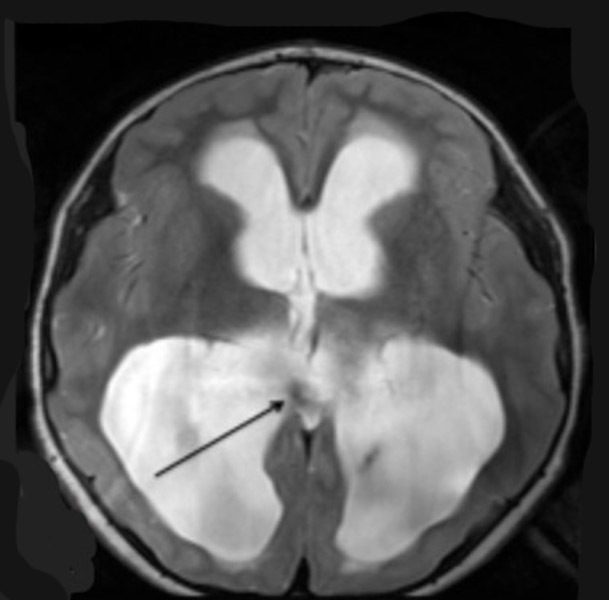 Compression of chiasm and hypothalamic-pituitary axis: An enlarged anterior third ventricle may be responsible for increased pressure on the chiasm and hypothalamo-hypophyseal axis (white arrow in image below). Enlargement of suprapineal recess: In more severe cases, the suprapineal recess may become markedly enlarged to occupy the whole of the quadrigeminal and superior vermian cisterns, displacing the vermis and cerebellar hemispheres downward, and dislodging and compressing the dorsal midbrain and posterior commissure (20) ( black arrow in image below). 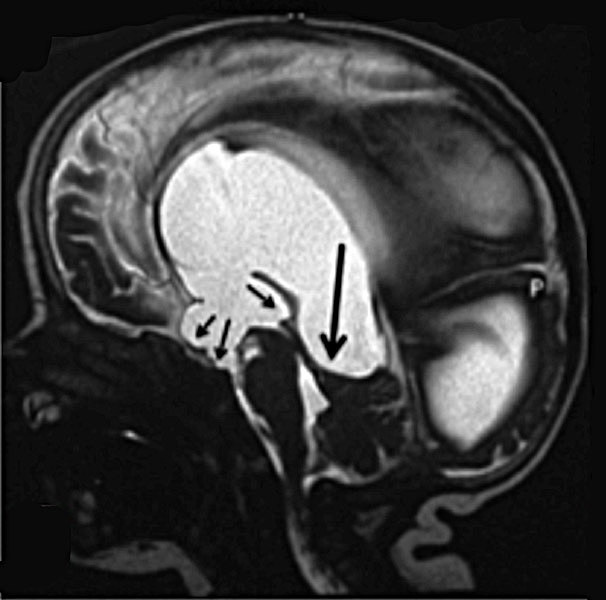 Compression of periaqueductal gray matter: The aqueduct above the obstruction also may be dilated, causing the compression of the periaqueductal grey matter and the stretching of the posterior commissure (18, 53, 66). Bounded by corpus callosum, fornix, and hippocampus: Atrial diverticula occur at the weakest point of the trigone where the wall is formed by splenium of corpus callosum above, crura of fornix inferiorly, and alvei and fimbriae of hippocampus (connecting splenium with crura) medially. 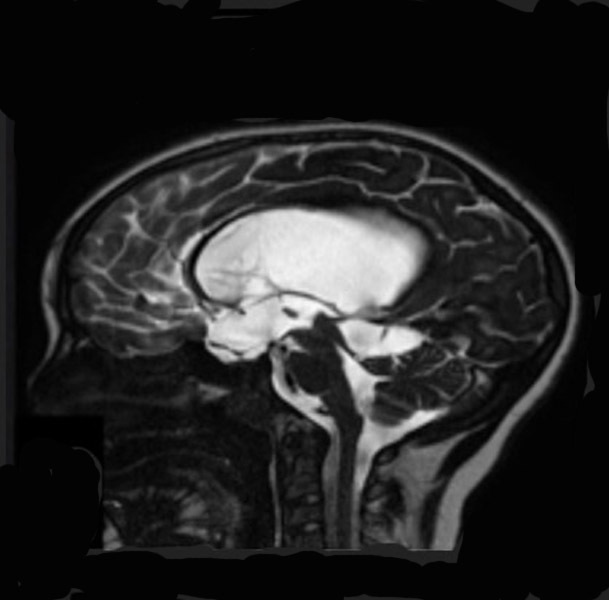 With progressive hydrocephalus and progressive expansion of atria, the alvei are displaced medially and stretched between the elevated corpus callosum and depressed fornix (see first image below) . With more severe atrial dilation, the alveus and crus became an extremely thin alvear-crural sheet. This sheet may shear, leading to a diverticulum ostium, bordered by splenium posterolaterally and crura anteromedially (see second through fourth images below). Endoscopic view of an atrial diverticulum: Seen is the osmium in the medial wall of the right lateral ventricle during exploration. Growing pulsion diverticulum through incisura: Following the formation of ostium, CSF pulsations may bulge the pia inferomedially to create the pulsion diverticulum. 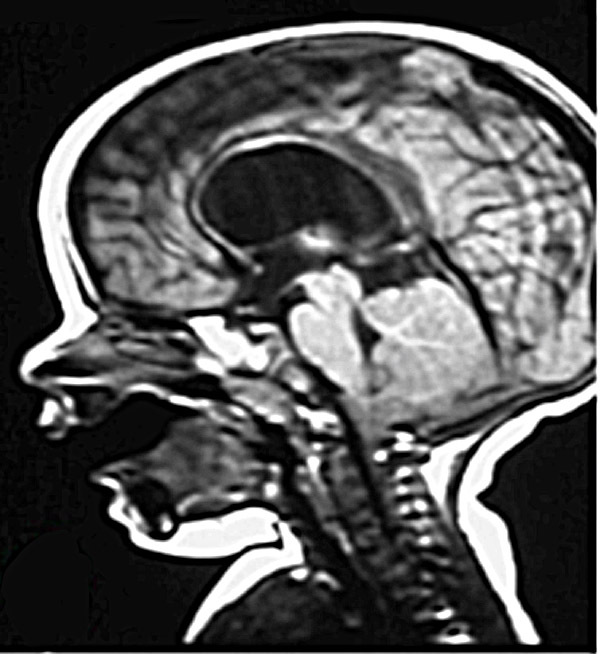 With progressive enlargement, the pial diverticulum and the arachnoid, which surrounds it, may bulge downward through the incisura, driven by the pressure gradient between the supratentorial and infratentorial compartment, forming an incisural and subtentorial “cyst” behind the midbrain within the ambient and superior vermian cisterns (75). Downward displacement of pineal gland, midbrain, and fourth ventricle: The enlarging atrial diverticulum typically dislocates the quadrigeminal plate, pineal gland, fourth ventricle, and vermis inferiorly and the straight sinus, tentorium, vein of Galen, and occipital lobes superiorly (see below) (75). Must differentiate from quadrigeminal cyst or trapped fourth ventricle: The atrial diverticulum can be mistaken (especially on CT scan) for a dilated fourth ventricle or an arachnoid cyst of the quadrigeminal cistern (see below) (75). 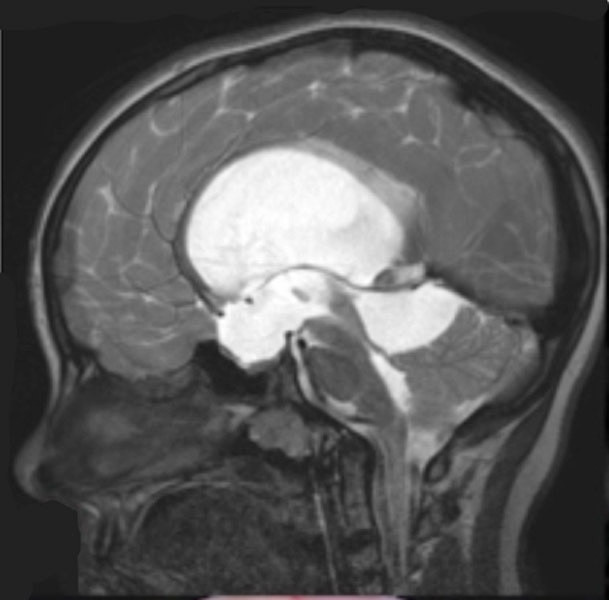 In this case the differential diagnosis is crucial because a quadrigeminal cyst should be managed with fenestration or shunting, which usually resolves also the associated hydrocephalus (21). In the case of atrial diverticulum, the treatment of hydrocephalus usually resolves also the associated diverticulum (see below) (75). MRI, flow-sensitive phase contrast MRI and, in more difficult cases, metrizamide CT ventriculography (75) may be useful to confirm direct continuity between the lateral ventricle and the cystic lesion in the quadrigeminal cistern in cases of atrial diverticulum. Separation of ependyma from subependymal layers: Spontaneous or iatrogenic ruptures of the ependymal layer, with CSF entering the subependymal space and dissecting the ependymal layer from the periventricular white matter, may cause subependymal dissection, with formation of enlarging CSF-filled cavities (75). 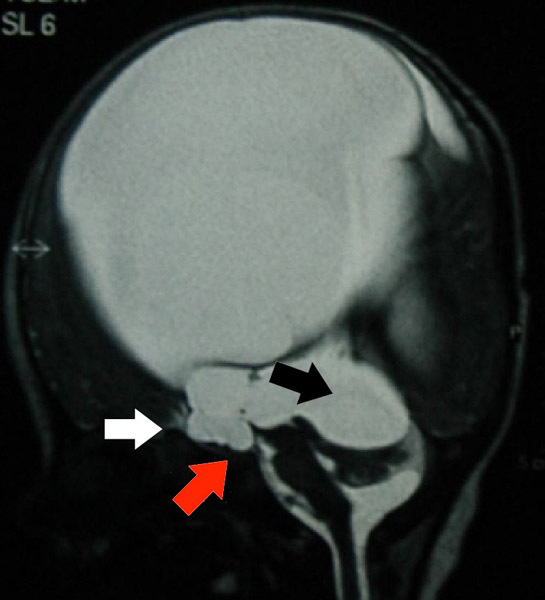 Rupture of weak points in walls of third ventricle: Ventriculocisternostomies may occur when the walls of the third ventricle, more often at the level of the lamina terminalis or the suprapineal recess, break in the subarachnoid space, causing in some cases a spontaneous compensation of hydrocephalus. Rare communication sinuses causing rhinorrhea: In rare cases ventricles may open into the subdural space or even into the frontal, sphenoidal sinuses or ethmoidal cells, whose walls have been progressive thinned by chronic increased ICP (66), with subsequent rhinoliquorrhea.